A Bognor Regis man caught driving with four different drugs in his system was ‘beyond his depth’ after racking up thousands of pounds of drug debt. 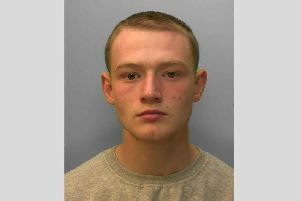 Worthing Magistrates Court heard on Tuesday how 18-year-old Jamie Aldred, of Firs Avenue West in Bognor Regis, had more than 800mg per litre of benzoylecgonine – a compound of cocaine – in his blood when pulled over in Chichester Road on September 17. The rating was the highest the test can give, at over 16 times the legal limit. He was also found to have over the legal amounts of cocaine, cannabis and MDMA. In a report compiled during an adjournment, his probation officer described how Aldred racked up £8,000 of drug debt with a notorious Bognor Regis drug dealer, leaving him fearing for his safety. “He has admitted the situation is ‘screwing his life up’,” he said. “He planned to go out and have a ‘complete blowout’ and considered an overdose to get himself out of the situation. Aldred admitted to being a recreational user of cannabis and said he had had a ‘heavy night’ beforehand, on September 16. “I know it’s not an excuse, but I only do drugs to take the stress away,” he said. The police officer who made the arrest described Aldred as having ‘glazed eyes’ and ‘dilated pupils’, but Aldred said he did not think the drugs would still be in his system so long after taking them. He pleaded guilty to all four counts of driving a motor vehicle with a proportion of a specified controlled drug above the specified limit. In his final address, the probation officer said he did not believe Aldred to be a drug addict and said he was aware of the ‘extreme predicament’ he had got himself into. He recommended a community, rather than custodial, sentence. “He is a young man who has got himself into a world which is well beyond his depth,” he said. Aldred was granted an 18 month conditional discharge for each charge, to run concurrently, by chief magistrate Victoria Willetts, due to his ‘previous good character’. He was also disqualified from driving for 18 months, fined £20 as a victim surcharge and ordered to pay £85 court costs.